With your donation of $15 plus shipping and handling, we will send you this fine poster of a magnificent Mangalarga Marchador suitable for framing! The funds collected will be allocated to a fund for Marchador Horses in need. Because this is a fund-raiser, you can also contribute more. The photo is her young Marchador stallion Canadian Regente, son of Talisma Kafe x Regina de Lazy T.
Limited quanties available! The poster is on high gloss paper and is a copy of an original. The horse depicted is her young stallion Canadian Regente in vibrant colors. For any art or Marchador afficiando, this is a great piece to decorate your walls! You can order yours today using the Paypal button below or send a check to Lynn Kelley, 10487 E Rising Sun Dr, Scottsdale, AZ 85262 who is distributing the poster. Shannon Ford is a natural born artist and an animal lover since childhood, Shannon Ford was born in Regina Saskatchewan, totally enchanted by the natural world. She was raised on a farm west of Calgary where she grew up loving Art and knowing horses, cattle and wildlife. 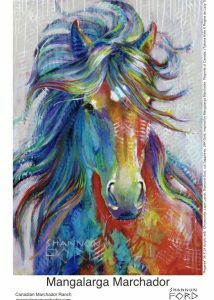 Shannon paints in both her Studios in Alberta, and in BC where she and her sweetheart Denis breed Mangalarga Marchador horses. Best known for her intuitive contemporary painting style and her use of her hand made precious and semiprecious gemstone powers, Shannon gives credit to her intuition, imagination and dreams in guiding her painting process. Shannon’s collectors value most the unique way her paintings appear well drawn and technically accurate from a distance while being free flowing, naturally abstract and infused with multiple colours when viewed from close up. She binds her love for sculpture and gemstones with her love for painting by incorporating her own handmade precious and semiprecious gemstone powders (and sometimes even cut gemstones and 24 Karat Gold or Palladium) to create paintings with a unique quality of surface, light and colour; capturing more deeply the true essence and beauty of the subject she is painting. This entry was posted in Fund Raiser and tagged Canadian Regente, Shannon Ford.